collectSPACE - news - "NASA shuffles shuttle schedule: Endeavour to fly after Discovery for final planned flight"
April 26, 2010 — NASA has rearranged the flight order for its final planned space shuttle missions, such that orbiter Endeavour will now have the distinction of making the last flight rather than Discovery, as earlier manifested. The shuttles' shuffle, which now has Discovery's STS-133 mission launching to the International Space Station (ISS) before Endeavour's STS-134 flight, was driven by a delay readying the latter mission's scientific payload for launch. As originally planned, Endeavour's STS-134 crew was to deliver the seven-ton Alpha Magnetic Spectrometer (AMS) cosmic ray experiment to the orbiting lab in late July. 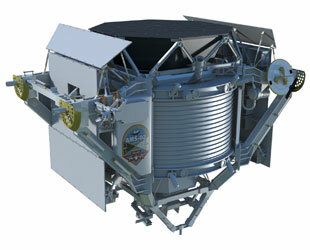 The state-of-the-art particle physics detector, once mounted to the station's exterior, is designed to examine fundamental issues about matter as well as the origin and structure of the universe. Ground tests conducted in the Netherlands, where AMS is currently, found that the liquid helium supply used to cool the experiment's superconducting magnet would only last two to three years. Once depleted, the AMS would cease working. With NASA and its international partners now planning to extend their use of the space station by at least five years to 2020, scientists decided to replace the superconducting magnet with an ordinary one, increasing the AMS lifespan but delaying when it would be ready to fly. "Given the ISS lifetime has been extended, the permanent magnet gives them a much longer science mission," said shuttle launch integration manager Mike Moses last week. "In that switch, they asked us to go look at and evaluate a... delay to that mission and what we could accomodate in the schedule." The soonest AMS scientists said they could now have the reconfigured experiment to the Kennedy Space Center in Florida would be in August. So instead of delaying both Endeavour's and Discovery's missions, the latter targeted for mid-September to deliver and install a fully-packed supply closet to the ISS, NASA decided to move the STS-134 mission after STS-133. "Collectively last Friday, the shuttle and station programs, along with [NASA] headquarters space ops, met to review the manifest and determined that the best course of action would be to give the AMS team as much time as they needed," NASA spokesman Kyle Herring said during an interview with collectSPACE.com. Hence Endeavour, the last of NASA's space shuttle fleet to enter service, having been built in the wake of the 1986 Challenger accident, is now planned as the last to fly. Mission managers have tentatively set mid-November for that final flight, although orbital mechanics may result in a further delay. For most of November, the station's angle in relation to the sun will subject it to higher heating, a period that constrains shuttle dockings. "There's a beta cutout that is currently right around Nov. 8 to the 25th," said Herring, adding that he has also heard a range of Nov. 7 through the 23rd. Add to that the existing schedule for Soyuz spacecraft to depart and arrive with station crewmembers, as well as a software issue preventing the shuttle from being in space over New Year's and the additional dockings scheduled for European and Japanese resupply spacecraft, and NASA's options for scheduling their final shuttle mission become further limited. "All of those factors basically led the programs to decide that it wasn't really necessary to pick an actual target date [yet]," Herring explained, saying that the timeframe alone would allow for the required planning for crew training and processing of the shuttle, and that they could "wait awhile and see how things progress over the next few weeks to months." The White House and Congress have approved funding to allow NASA to slip the last flight into fiscal year 2011 but beyond that NASA would require additional money. 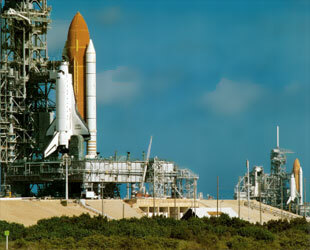 "The [shuttle] program is only budgeted through the end of the calendar year," described Herring. "Anything beyond that, obviously, is a budgetary discussion." Should Endeavour liftoff in late November, its commander will find a familiar face waiting for him when he docks with the space station. Mark Kelly will be greeted on the other side of the hatch by Scott Kelly, his identical twin brother, whose own launch onboard a Russian Soyuz is scheduled for September. The brothers' on-orbit reunion would mark a first for family members being in space at the same time, other than by married couples. Flying with Kelly on Endeavour are pilot Greg H. Johnson and mission specialists Mike Fincke, Drew Feustel, Greg Chamitoff and European Space Agency astronaut Roberto Vittori. 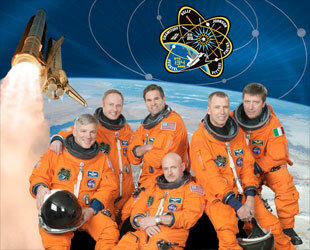 NASA announced them as the crew of STS-134 in August 2009 and they have been in training for the 12-day mission since then. Discovery's STS-133 crew, who were named a month later to what was then billed by NASA as the "final scheduled space shuttle mission," are Steven Lindsey, commander; Eric Boe, pilot; and mission specialists Alvin Drew, Nicole Stott, Michael Barratt and Timothy Kopra. Their flight still remains targeted for September 16 to deliver the Leonardo permanent logistics module to the station. Before either Discovery or Endeavour can launch, Atlantis is scheduled for one more mission, STS-132, set to liftoff with a Russian mini-research module on May 14.